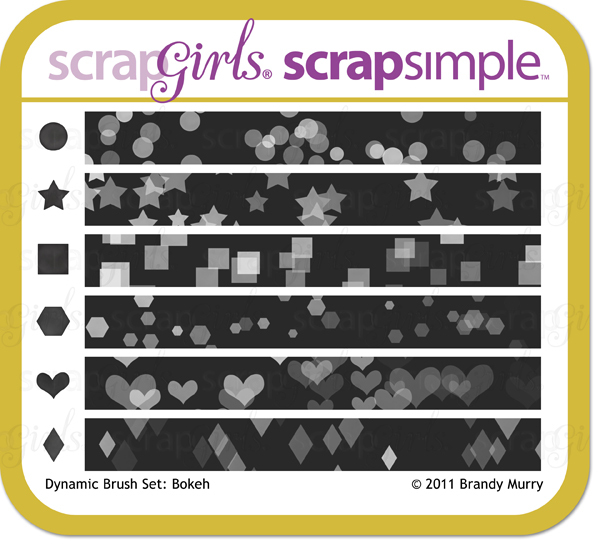 Today we will be learning about how to use the Dynamic Brush Set: Bokeh 8501 effectively in your digital scrapbooking layouts. There are three steps I like to call the “3 B’s” – Brush, Blur, and Blend. Here’s the photograph I am starting with. I added the diffuse glow filter in Photoshop to get it dreamy. You can find this filter by going to Filter> Distort> Diffuse Glow. You want the darkest color in your photo as the foreground color and the light color as your background. In this case, I used Dark Brown and Creamy White. Now it’s time to add some magic! So let’s just get started with the first step… BRUSH! To begin, let’s reduce the size of the brush and choose a color found in the photograph. I made my brush size 300 and picked a creamy white found in the photo. Then I just brushed across the page from the bottom right diagonally to the top left. The next step is to BLUR the Bokeh. I just like to blur mine a little, but you can play around with what suits your taste. To Blur the Bokeh, select that layer then go to Filter> Blur> Gaussian Blur. I moved the slider to 4. Now we have added a soft blur to the Bokeh layer. I added two more layers. One layer in Blue and one in the Dark Pink using the same method as above with the white. I blurred both layers (the blue slightly more). This is the result of the 3 B’s: Brushing, Blurring, and Blending! I used the same technique as above in my layout on the background papers to get an overall magical feel.